One can hardly discuss the configuration of the deep ocean bed without eventually using the term ‘seamount’. Today, the existence of tens of thousands if not over 100,000 seamounts is taken for granted. But in the not so distant past, their existence was unknown and not even suspected. Even as Agassiz was writing these words, there had already been whisperings of how wrong he was. In 1869, the Swedish corvette Josephine, with scientists Professor F. A. Smitt and Dr. Axel Vilhelm Ljungman directing operations, was engaged in an ambitious project to conduct deep-sea dredging operations between Europe and North America. On 2 July, it deployed its dredge approximately 200 nautical miles west of Cape San Vincent, Portugal, on a trip that it was assumed would travel at least 2,000 fathoms vertically and take an hour or so to reach the bottom. However, after a few minutes the dredge rope stopped paying out and slack was noticed in the line. The dredge had struck bottom at a little over 100 fathoms. It had landed on what has become known as Josephine Seamount, the first seamount discovered as a direct result of oceanic exploration. It is doubtful that either Smitt or Ljungman ever realised the significance of their discovery. Four years later, Lieutenant George Belknap on the USS Tuscarora began a revolution in deep-sea sounding methods by being the first to successfully use Sir William Thomson’s piano-wire sounding machine while conducting a telegraph cable survey in the North Pacific Ocean. This expedition discovered the first known stand-alone seamounts in the Pacific Ocean. The first of these was a peak on the Gorda Ridge off the coast of northern California. It rose nearly 700 fathoms above the surrounding seafloor. Subsequent to that discovery, the Tuscarora sailed south to San Diego and thence to Honolulu. This first leg netted indications of a seamount when a 500 fathom jump occurred between soundings of 2159 fathoms at Latitude 26 22 N 137 22 W and a subsequent sounding of 2650 fathoms approximately 40 nautical miles distant. Another seven were sounded upon as the Tuscarora traversed the Mid-Pacific Mountains, the Marcus-Wake Seamount Group, and the Ogasawara Plateau region of the western Pacific Ocean. Amazingly, many of Belknap’s soundings can be found on the most recent edition of NOAA Chart 530 of the North Pacific Ocean. The scientific community took little note of Belknap’s work. The majority of his soundings also recovered bottom samples. On virtually all seamounts that he sounded on in the western Pacific Ocean, coral fragments were recovered indicating that these peaks were once in shallow water. This was both a clue as to the age of the mountains as well as evidence supporting Darwin’s theory of island subsidence versus John Murray’s theory of upward accretion of coral reefs. The scientific community argued over aspects of Darwin’s theory for over 75 years following the Tuscarora expedition until vindicating Darwin. Curiously, the contemporaneous Challenger Expedition apparently did not discover any seamounts. John Murray, the editor of the Challenger Reports, seemed to have been more concerned with ’deeps’ than with submarine peaks as his maps from the expedition had many named deeps but few named bathymetric highs. In spite of these successes, few additional undersea peaks were added to knowledge of the seafloor over the next decade. An exception was a sounding expedition across the Atlantic in 1878 in which the USS Gettsyburg after passing over Josephine Seamount approaching the Straits of Gibraltar, sounded on Gorringe Ridge with its accompanying peaks of Gettysburg Seamount and Ormonde Seamount. The ridge was named for the captain of the Gettysburg. British telegraph cable surveyors developed the Lucas Sounding Machine, a type of piano-wire sounding machine in the mid-1880s and discovered a few more peaks. Among them were Dacia Bank, Seine Bank, and the Coral Patch – all discovered in the same region as Josephine Bank. Seine Bank was discovered by the breaking of a cable on a line previously surveyed with a spacing of 25 miles. When laying telegraph cable between soundings of 2400, 1967, and 2332 fathoms, the cable suddenly parted. When checking the depth, it was found to be 100 fathoms. Thus, Seine Bank was discovered and named for the unfortunate cable ship. Faraday Seamount and Minia Seamount in the North Atlantic Ocean were discovered in 1882 and 1903 respectively by the cable ships Faraday and Minia . These seamounts were in the path of the preferred telegraph cable route between Ireland and Newfoundland. sounding, an average of one per 7,000 square statute miles throughout the world ocean. Few additional seamounts were discovered in this period. The famous German Meteor Expedition, and follow-on German expeditions, discovered a number of south Atlantic seamounts including Spiess, Schmidt-Ott, Merz, Meteor, and the north Atlantic seamounts – Echo, Altair, and Great Meteor. 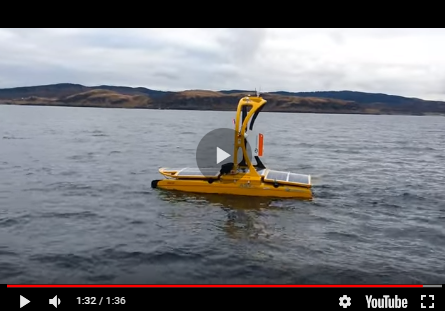 While German scientists were exploring the Atlantic, the United States Coast and Geodetic Survey embarked on a programme to survey the United States West Coast and the Gulf of Alaska. Year after year until the beginning of World War II, C&GS ships marched down the west coast with systematic surveys and also followed a systematic series of tracklines crossing the Gulf of Alaska. These surveys netted San Juan, Rodriquez, Davidson, Guide and Pioneer Seamounts off the California coast, and a number of seamounts named after C&GS officers in the Gulf of Alaska. The United States Navy was also active during this period. In particular, a fleet oiler, the USS Ramapo, made 65 transits of the North Pacific between 1929 and 1940 and made tens of thousands of soundings. Soundings of the Ramapo and other naval vessels provided much of the material for Navy Charts 5485 and 5486 which had numerous seamounts among other features. However, few of these Pacific seamounts were named at the time of discovery. This outpouring of effort in the early years of acoustic sounding netted approximately 200 seamounts. But in spite of its use in this article to describe mountains in the sea discovered by early surveyors, the term seamount was not widely used until 1938 when the United States Board on Geographic Names designated a large undersea mountain Davidson Seamount. This mountain was discovered by the C&GS ship Pioneer in 1933. Citation for the official name read: Davidson Seamount: a submarine elevation in mountain form which rises from a depth of 1900 fathoms to within 729 fathoms of the surface, near lat. 35°43’30” N., long. 122°43’10” W., about 75 miles west of Point Piedras Blancas, California, in the Pacific Ocean. Named in honour of George Davidson (1825-1911) of the US Coast and Geodetic Survey who, as chief of party and later in charge of all Coast Survey operations on the Pacific Coast, was active in charting the waters of the west coast.” This note goes on to add: “The generic term ‘seamount’ is here used for the first time, and is applied to submarine elevations of mountain form whose character and depth are such that the existing terms bank, shoal, pinnacle, etc., are not appropriate.” Since 1938, over 1100 additional seafloor features have been termed seamount while more than 150 have been designated by the related terms tablemount and guyot. This article conitnues - see also Mountains of the Sea - II.